A 1998 Porsche 911 GT1 Strassenversion and 1993 Porsche 964 Turbo S Leichtbau were announced for the Gooding Amelia Island 2017 sale. These million-dollar-plus cars will be joined at the Florida auction by two further high-performance Porsches; a 2011 Porsche 997 GT3 RS 4.0 and a 2011 Porsche 997 GT2 RS. 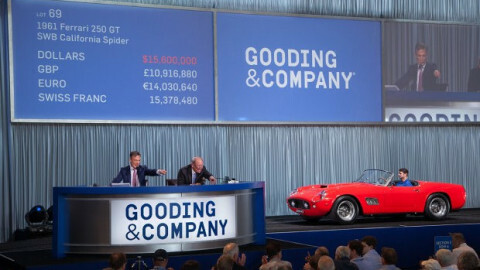 Gooding & Company traditionally has much success with Porsches, especially at Amelia Island, where in 2016 it sold 14 Porsches from Jerry Seinfeld’s collection. The first cars announced for the Gooding & Co Amelia Island 2017 classic car auction were four limited production, high-performance Porsche supercars from a private collection: a 1998 Porsche 911 GT1 Strassenversion, 1993 Porsche 964 Turbo S Leichtbau, 2011 Porsche 997 GT3 RS 4.0 and 2011 Porsche 997 GT2 RS. “We are honored to present these four exciting Porsche supercars from a private collection at our Amelia Island Auction. These cars represent a brilliant collaboration between Porsche’s Exclusive and Motorsport departments, combining state-of-the-art performance technology with bespoke features,” notes David Brynan, Senior Specialist at Gooding & Company. The 1998 Porsche 911 GT1 Strassenversion (Estimate Available Upon Request) announced for Gooding’s Amelia Island 2017 sale is a rare street version of the GT1. The 911 GT1 Strassenversion is the only Porsche model ever offered from the factory as a race car first and then homologated for road use. The 911 GT1 race cars delivered remarkable results in motorsport, including a class and overall win at the 1998 24 Hours of Le Mans. 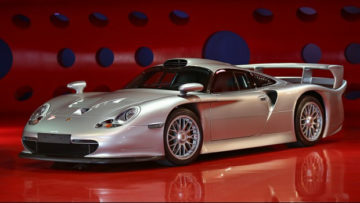 Only 20 911 GT1 Strassenversions (street versions) were built for road use, and all were pre-sold to Porsche’s top VIP clients, making them virtually unattainable. With over 530 hp, the GT1 Strassenversion offered world-class performance and featured spectacular aerodynamic bodywork built from exotic composite materials. Delivered new in Germany, this 911 GT1 is finished in its original Artic Silver Metallic livery and has less than 5,000 miles from new. Porsche GT1s seldom come up for public auction, and service records, books, original tools, and a Porsche Certificate of Authenticity accompany the sale. This is a rare opportunity for collectors to own the ultimate road-going Porsche supercar. A 1997 Porsche 911 GT1 Evolution – one of the racing cars made road legal – sold for €2,772,000 at the RM Sotheby’s Monaco 2016 sale. The 1993 Porsche 964 Turbo S Leichtbau (Estimate: $1,300,000–$1,600,000) is the latest Porsche to regularly sell for over a million dollar – two sold in 2016. The Porsche 964 Turbo S Leichtbau was the first lightweight, turbocharged production model built by Porsche. This model was also the first entirely built by the Sonderwunsch (special wishes) and Motorsport divisions, and the first to carry the “S” designation. The 964 Turbo S Leichtbau is essentially a road-going model of the 1992 IMSA SuperCar Champion. Only 86 examples were built, of which only 67 are left-hand-drive, such as the car presented here. An exclusive and track-ready version of the 964 Turbo, every effort was made to reduce weight, including the removal of air-conditioning and radio. With long term, single family ownership, this car is unmodified and has less than 1,400 miles on the odometer. This 964 Turbo S Leichtbau is finished in a striking Speed Yellow exterior and is identical to the car displayed at the Porsche Factory Collection museum in Zuffenhausen, Germany. It is accompanied by the factory build sheet, service records, and a Porsche Certificate of Authenticity. The 997 GT2 RS is a true “Skunkworks” effort between Motorsport and Exclusive divisions. At the time of its introduction, it was the most powerful road vehicle ever built by Porsche, boasting over 620 hp, and was the first and only turbocharged model to ever carry the famous RS name. The 2011 Porsche 997 GT2 RS (Estimate: $550,000–$650,000) at the Gooding Amelia Island 2017 sale is one of only 142 built for the North American market and one of only 33 that have the most desirable combination of carbon fiber sport bucket seats and carbon fiber fenders. This GT2 was additionally optioned with a lightweight battery, lightweight headlights and desirable sport steering wheel. Completely original, this striking black GT2 RS had two owners from new, has traveled less than 3,000 miles and comes complete with service records, original window sticker and a Porsche Certificate of Authenticity. Porsche built just 600 examples worldwide of the track-ready 997 GT3 RS 4.0, of which only 158 were delivered to the North American market. 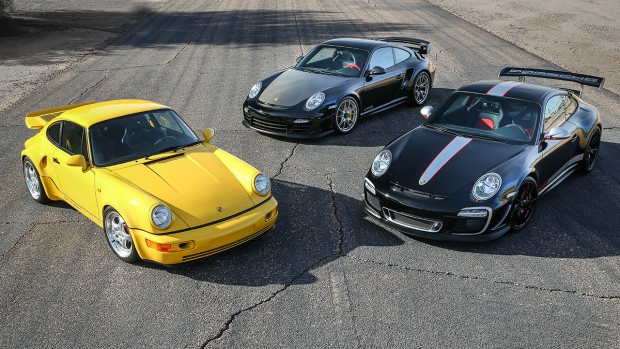 These cars have direct lineage to the famed 911 SC/RS and 964 RS 3.8 Porsches and were the ultimate track weapon that could also be driven legally on American roads. This 2011 Porsche 997 GT3 RS 4.0 (Estimate: $650,000–$750,000) is one of only 12 ordered as a radio-delete model to further reduce weight, and one of only two ordered in black. This GT3 RS 4.0 also has many unique and desirable special-order options and has traveled less than 130 miles since new. It comes with the original window sticker, all original books, manuals, service records and a Porsche Certificate of Authenticity. High-end Porches will be at auctions in high numbers in 2017: at least six are expected to sell for over a million dollars at the various Scottsdale 2017 auctions with many more on offer in Paris in February and Amelia Island in March.